Persistent Market Insights (PMR) analyses the Cold Plasma Market in its new publication titled “Cold Plasma Market: Global Industry Analysis 2012 – 2016 and Forecast 2018 – 2026.” This study provides data for 2017 along with the forecast for the period (2018–2026). The main objective of the report is to identify dynamics in the market and provide recent updates and insights pertaining to various segments of the Global Cold Plasma market. To provide a better understanding of the Global Cold Plasma market, the report also includes analysis of drivers, restraints and trends, which influence the current market scenario and are expected to impact the Global Cold Plasma market over the forecast period. The study provides data for 2017 along with a comprehensive market forecast for the period 2018–2026. To understand and assess market opportunities and trends, the global Cold Plasma market report is categorically split into different sections based on equipment type, application and regions. The report starts with the market overview and provides market definition and taxonomy along with supply chain, drivers, restraints and trends in the Global Cold Plasma market. The sections that follow includes the global Cold Plasma market analysis based on equipment type, application and regional/country level analysis. All the above sections evaluate the market on the basis of various factors affecting the market. Each section discusses the qualitative and quantitative aspects of the global Cold Plasma Market. To give a brief idea about revenue opportunities from application and region/country-wise segments, the report also provides market value (US$ Mn) data, absolute $ opportunity and total incremental opportunity for each segment over the forecast period (2018-2026). In the final section of the report, we have provided a detailed competition landscape with overall market structure, company market share and performance, in order to provide report audiences with a dashboard view of key players operating in the global Cold Plasma market along with their business strategies. This would enable clients to assess strategies deployed by market leaders and help them develop effective strategies accordingly. For market data analysis, we have considered 2017 as the base year, with market numbers estimated for 2018 and forecasts made for 2018–2026. The report considers the market size of the Cold Plasma market at a global level and splits & evaluates the market at a regional level. The forecast assesses the total revenue (US$ Mn) of the global Cold Plasma market. To provide an accurate forecast, we have started by sizing up the current market, which forms the basis of how the global Cold Plasma market is expected to develop in the future. The critical market data, including the base number and segment splits, has been devised through in-depth secondary research. This data is then triangulated on the basis of different verticals, considering both supply side and demand side drivers and other dynamics of the various regional markets, along with primary interviews of Cold Plasma manufacturers, distributors & suppliers and industry experts operating in the global Cold Plasma market. The forecast presented in the report evaluates the actual market size (US$ Mn) in 2017 and the expected market value of the global Cold Plasma market over the forecast period. We have also analyzed the different segments of the global Cold Plasma market in terms of basis point share (BPS) to understand individual segments’ relative contribution to market growth. This detailed level of information is important for identifying the various key trends governing the global Cold Plasma market. The report also analyses the global Cold Plasma market based on the absolute dollar opportunity. This is usually overlooked while estimating the market forecast. However, from a business development perspective, it is essential to identify absolute dollar opportunity is essential to identify potential resources in the Cold Plasma market. Moreover, PMR has developed a market attractiveness index to understand the key segments in terms of their performance and growth in the global Cold Plasma market. This market attractiveness index would help clients to identify real market opportunities in the global Cold Plasma market. The global market for cold plasma is estimated to account for US$ 1,402 Mn by the end of 2018 and increasing at a CAGR of 16.3% during the forecast period (2018–2026), is projected to reach a market value of by US$ 51,314.6 Mn by 2026 end. Moreover, the demand for Sterilization & Disinfection application of cold plasma is projected to grow at a significant CAGR of 17.2% during the forecast period and is expected to reach a market value of US$ 1,124 Mn. The adhesion segment, in the Cold Plasma Market will witness highest growth rate during the forecast period as it has very important applications in various growing end-use industries, such as automotive, aerospace, electronics & semiconductors, etc. Food decontamination and food spoilage minimization during food production, food processing and packaging are critical issues that must be addressed to ensure food safety and sustainability. Additionally, the cold plasma technology has given a new direction to the concept of food decontamination under ambient circumstances, which in turn, will propel the market of cold plasma over the forecast period. That apart, cold plasma finds many other applications in other industries. Owing to the growing applications of cold plasma in various industries, such as printing, adhesion, coating and others, the demand for cold plasma is also cumulatively increasing across the globe. Furthermore, certain benefits of cold plasma, such as improved wettability, less chemical consumption and less water consumption, are aiding the growth of the cold plasma market. Market penetration in untapped markets coupled with market expansion of existing bases has been the pivotal strategy employed by cold plasma manufacturers. Major players involved in the Cold Plasma Market are emphasizing on acquisitions, partnerships, collaborations & expansions to enhance their operational efficiency. The global Cold Plasma Market is segmented on the basis of regime, end use sector, application and region. On the basis of regime, the global Cold Plasma Market is segmented into Low Pressure and Atmospheric Pressure. 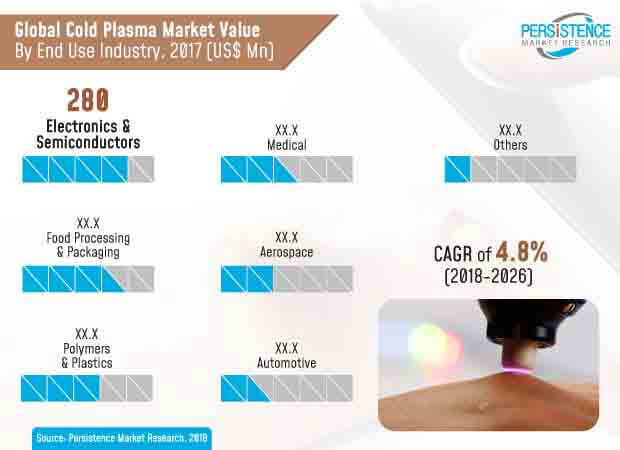 On the basis of end use sector, the global Cold Plasma Market is segmented by Automotive, Electronics & Semiconductors, Food Processing & Packaging, Medical, Aerospace, Polymers & Plastics and Others. On the basis of application, the global Cold plasma Market is segmented into Surface Treatment, Sterilization & Disinfection, Coating, Finishing, Adhesion, Wound Healing and Others. Key regions covered in the report include North America, Latin America, Europe, Middle East & Africa and Asia-Pacific. From a regional perspective, the Cold Plasma Market in Asia Pacific region is projected to witness relatively fast growth rate over the forecast period. North America is estimated to account for more than 28.6% share in the overall market by 2026 end. The market in Europe is expected to register a CAGR of 16.1% in terms of value over the forecast period. The Cold Plasma Market in Middle East and Africa is expected to reach US$ 210 Bn by the end of 2026 while increasing at a CAGR of 15.5% over the forecast period. Market growth rate in Middle East and Africa region and Latin America is expected to remain moderate as compared to the global average between 2018 and 2026. Some of the players reported in this study on the global Cold Plasma Market are Linde AG, Nordson Corporation, ADTEC Plasma Technology Co., Ltd., Bovie Medical Corporation, Europlasma NV, Tantec A/S, Henniker Plasma, Vetaphone A/S, Plasmatreat GmbH, Neoplas Tools GmbH and others.